We plate individual parts or also mass parts from 1 mm to 3.5 m in length with gold. If gold is used for decorative purposes, in ideal cases it imparts the same appearance to a gilded object as if it were made of solid gold. However, only very little gold is needed. In decorative gilding, a workpiece is usually plated with nickel before the actual gilding is performed. Preliminary nickel-plating of this kind allows gold coatings of only 0.1 to 0.2 µ Au to be applied, so that gold can be saved. In the case of 0.1 µ Au, we only need 2 g Au to plate 1 m²! We plate about 4000 to 5000 m² of metal surface with gold every year. 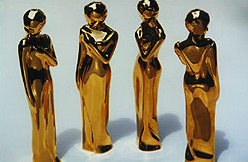 Romys - 24 kt gilded TV prizes awarded every year by a major Austrian daily newspaper that were gilded by us. 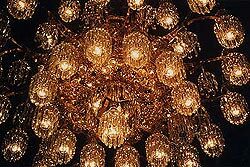 Detailed view of a chandelier in the Small Redoutensaal. Severely damaged by a fire in 1992 - restored in 1996 under the supervision of the Federal Office for the Protection of Historic Monuments. The visible metal parts were successfully gold-plated by MERSI according to the traditional decoction gilding method!